Slow down. No one’s in a rush now. 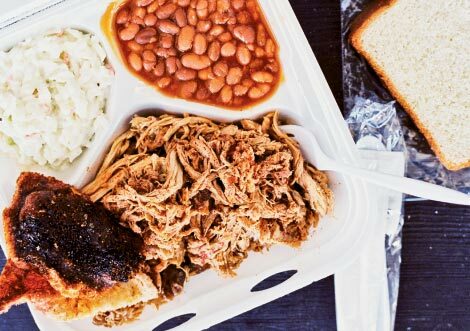 It’s the start of the weekend, and from two-lane roads, the trucks and sedans are pulling into barbecue parlors from Islandton and Edisto Island to Holly Hill and Hemingway. Inside, men and women are filling plates just as they have for decades. Steam rises from the slow-cooked pork that’s been pulled from the bone and seasoned and sauced to add a peppery kick, mustard bite, or a tangy sweetness. Tradition, location, and personal taste dictate the recipes and the cooking processes, but every pound of slow-roasted meat involves fire and patience. 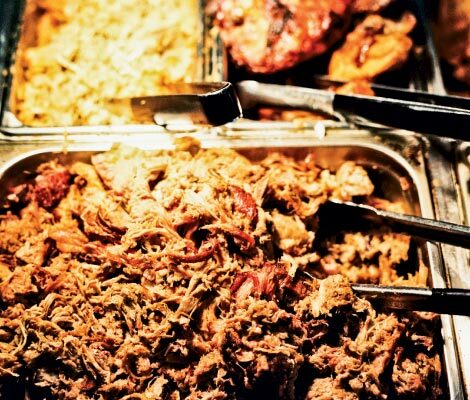 Sure, you can find Carolina-style barbecue within the urban boundaries of Charleston. 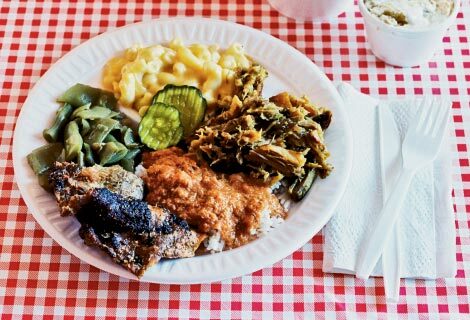 But these are the drive-to-the-source kinds of food excursions—destination road trips an hour or two into the countryside for “BBQ” or “bar-b-que” by the foam plate-full, piled beside rice and beans or soft bread and pitchers of icy, syrup-sweet tea. So leave the hurrying behind and do this right. Let’s go. The billboards for a beach music and shag festival have faded near the Highway 17 turnoff to Edisto Island. 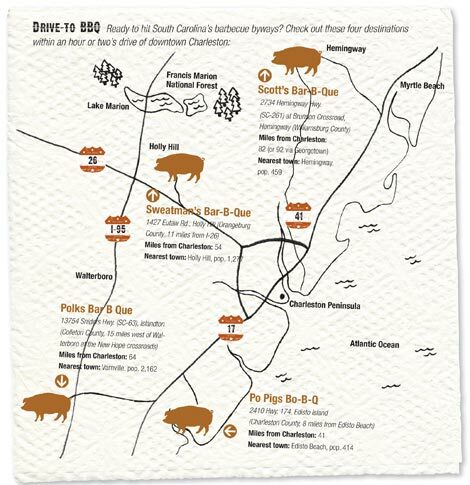 But at a stop along SC-174 to Edisto Beach, customers in khaki pants and year-round suntans who open the door to Po Pigs Bo-B-Q look ready for dancing—or at least for a weekend at a beach house. Opened in 1999, this is barbecue for the beach and football crowd, served in a dining room that shares a building with a gas station. 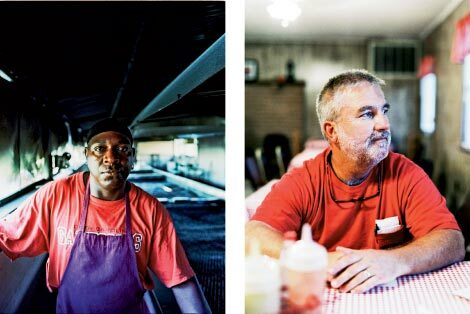 Dressed in a Clemson shirt, shorts, and a cook’s apron, owner Robert Lee (“call me BoBo”) explains that before he started Po Pigs, he was a partner in the Pavilion restaurant at Edisto Beach. He introduces George Green, a former military mess sergeant and Edisto native who has helped to cook the dry-rubbed pork butts and shoulders every week for much of the past decade. Raised in Sumter, South Carolina, Lee recalls that as a kid he’d ride in the family car to pick up pounds of hot barbecue from a man “who cooked it whole hog, sopped in vinegar and wrapped in brown paper. 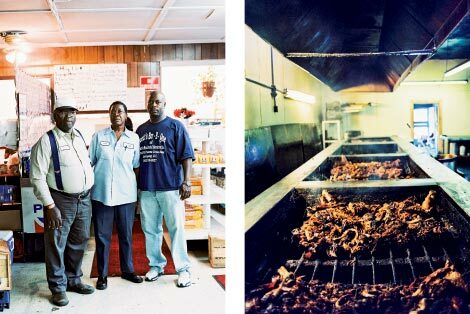 It was hard to get that package home without sneaking some.” Lee admires the regional differences in barbecue, and at Po Pigs, he’s concocted sauces that give a tasting tour of several Carolinas variations. Kept in labeled squeeze bottles at each table, the four house-made varieties are Pee Dee (red pepper and vinegar, with the heat of eastern North Carolina barbecue), Midland (mustard, vinaigrette-style and not creamy), Orangeburg (sweet mayo and pickle juice, a Duke’s Mayonnaise recipe), and Carolina Red (tomato-sweet, peppery). Po Pigs also stocks an impressive line of more than a dozen hot and cold sides—most are family recipes—on the long buffet counter at the back of the store, including squash casserole, tomato salad, chicken stew with hard-cooked egg, and lemon custard pie. 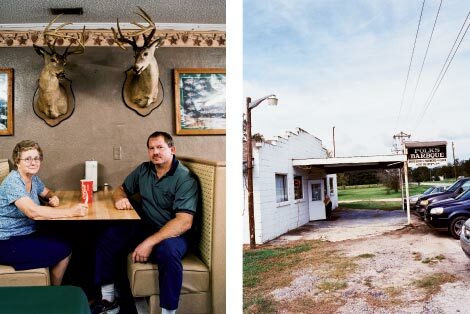 And to attract local customers and beach tourists, Lee bucks the traditions of many other barbecue joints by offering wine and beer choices along with soda and tea. Edisto Islander George Green and Sumter native BoBo Lee; for more than a decade, beachgoers and residents alike have stopped at this favorite haunt in the corner of a building shared with a gas station. The deer are so thick around here, sometimes we have to sweep them off the porch,” says 80-year-old Kenneth Stanley, who’s finishing a lunchtime plate of barbecue and sides at Polks Bar B Que in Islandton. Signs for deer hunting clubs—as well as cob corn and boiled peanuts—are common on SC-63 along the way to the barbecue parlor that’s about 15 miles west of Walterboro. All around are farmhouses, fields, and woods. And inside, above the booths and tables, antlers and mounted deer heads line the wall. Most of the bucks were taken by the late Thomas Polk, a tobacco farmer and hunter who founded the place in 1982 with his wife, Azilee. Family Style: The booths are a new addition at Polks Bar B Que, founded by Azilee Polk (left) and her husband, Thomas. Now son Michael (right) cooks the ’cue. 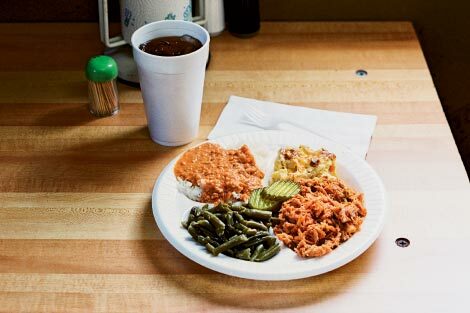 Country Cooking: A beacon for the hungry, Polks is the only restaurant for miles on SC-63 near Walterboro. Before the car door is open, you smell the smoke of an oak fire. You see the dangling letters that once spelled “SCOTT’S VARIETY.” This is Scott’s Bar-B-Que, situated just outside the town center of Hemingway, where the Scott family has been cooking up wood-smoked barbecue since 1972. On a bench in front of the white-and-blue-painted building, founder Roosevelt “Rosie” Scott is sitting with friends selling baskets of sweet potatoes. Cars are pulling in and out of the lot, and inside the screen and glass door—that closes with a loud slam, if you don’t catch it—are still some elements of a country grocery. Racks of packaged snacks; shelves of canned vegetables; and a few tables, chairs, and tall stools fill the small space. Just beyond a display of Sunbeam sandwich bread is a narrow aisle for a line to form at the counter, behind which Rosie’s wife, Ella, and a couple of her sisters and a niece are preparing orders. At least a dozen people are waiting in line when a young man empties an armful of clear plastic bags of just-wrapped, fried pork skins into a galvanized tub. Without pause, nearly everyone in line reaches in for a bag or two—the skins are crackling crisp, but also rawhide-chewy in the parts where bits of fried meat are still clinging. Members of the Scott family are working in the kitchen and in the smokehouse. Rosie and Ella’s son Rodney learned to cook barbecue from watching his father, and the younger Scott is frequently invited to events throughout the South to cook and talk about the traditions and techniques of coal-fired, whole-hog cooking. He says people are often surprised that the family cuts and splits their own wood out back, using oak (for smoke), hickory (for heat), and pecan (for flavor). BBQ Dynasty: Parents Roosevelt and Ella Scott with their son, Rodney, at the store that’s been featured in The New York Times and Saveur. In the smokehouse, the wood coals add heat and flavor. For years, he’d meet friends every Friday for a long lunch at Sweatman’s. 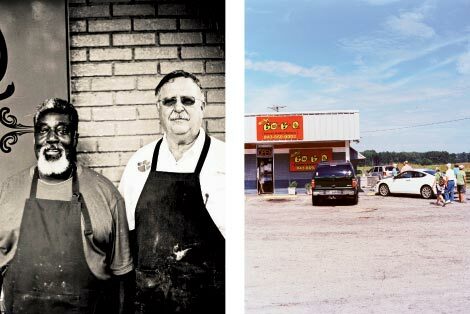 Then in the fall of 2011, Behr bought the place, which traces its start to Bub and Margie Sweatman, who first served barbecue in Holly Hill in 1959. Behr is following the traditions and history. He made some repairs to the buildings and added some sides to the buffet, but he says he never considered changing the way they cook the barbecue—over oak and hickory coals. A tangy mustard sauce is the standard here, but diners can add extra sweet mustard, tomato, or pepper sauces at the table. Behr’s daughter, a nurse, is at the cash register, and his wife is in the kitchen helping a busy crew to fill to-go orders while a University of South Carolina football game plays on a TV hung overhead. This is a family place, and everyone eats intently. No music, beer, or wine here. Just a barbecue buffet, a large, tidy dining room set with gingham tablecloths, and a hostess who circles the room refilling everyone’s all-you-can-drink sweet tea and lemonade. Pit Crew: Joe Brunson (left) and owner Mark Behr are part of the team that cuts the wood, tends the fires, and cooks up the ’cue for the Friday and Saturday crowds. Guests may order by the plate, or go for all-you-can-eat.